The wall cavities of Fairfield Glade homes carry a number of infrastructure elements like water line and drain lines. SERVPRO techs are trained to locate the leak and minimize the deconstruction needed during the restoration process. 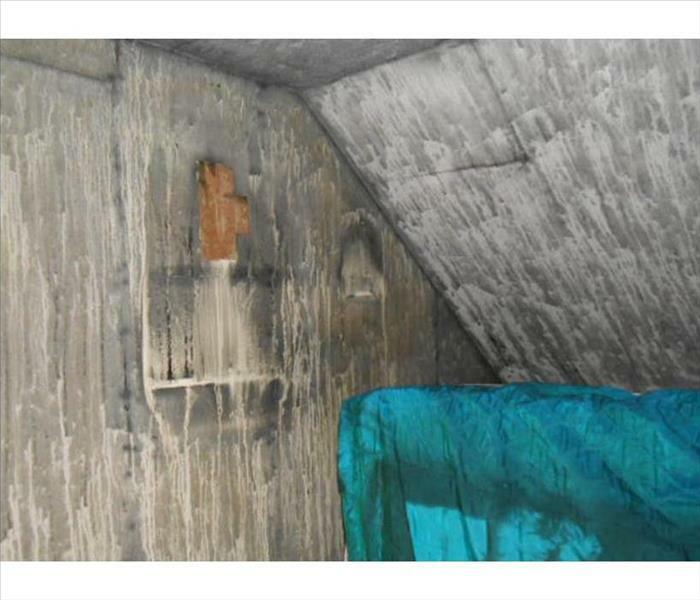 The water from the extinguishing efforts embedded the walls and ceiling of this finished attic room in a Sparta home with a messy residue. 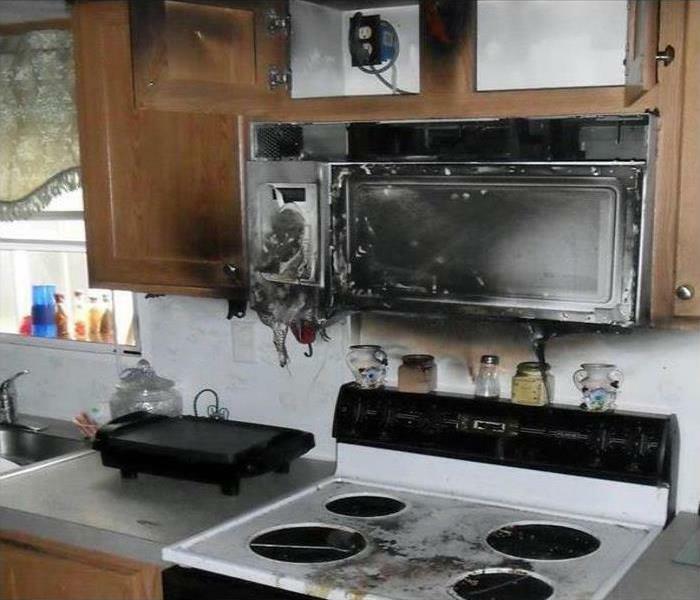 Fire and smoke damage can take many forms including the not visible smoke odors, and not just the stains. 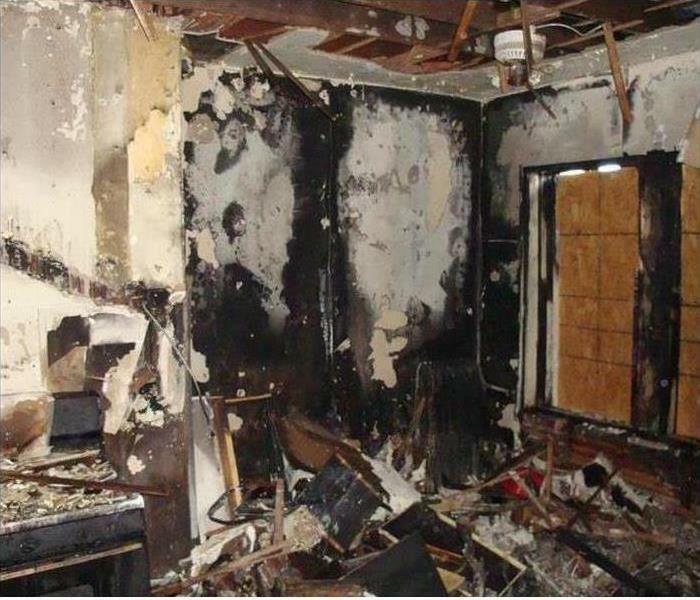 SERVPRO has the answers to restore this fire damaged area to its preloss condition. Got commercial water damage in Lake Tansi? Our team is your best option! We are highly skilled, and IICRC certified. We're ready 24/7, locally owned and operated, and Faster to Any Size Disaster. SERVPRO of Cumberland, Morgan & White Counties has the training and equipment to restore your commercial property to pre-damage condition. When a commercial building suffers a mold attack in Sparta, the wise call is to SERVPRO because We're Faster To Any Size Disaster! We always try to work around the business environment with as little fuss as possible. Removing sheetrock and insulation, and then spraying an antimicrobial agent can resolve this mold damage problem. 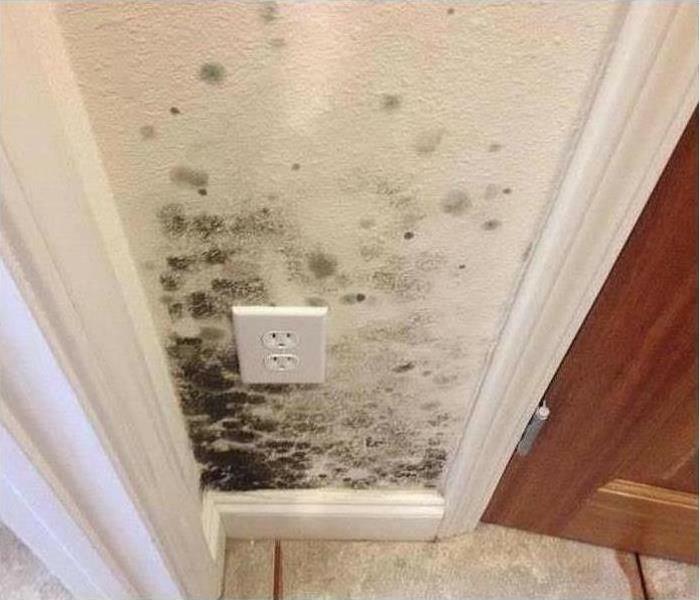 Mold can spread fast through your commercial property if left untreated. Our team of experts can respond immediately, working to contain the mold infestation to help prevent its spread to other parts of your building. SERVPRO of Cumberland, Morgan & White Counties has the equipment, training, and experience to restore your property to pre-damage condition. 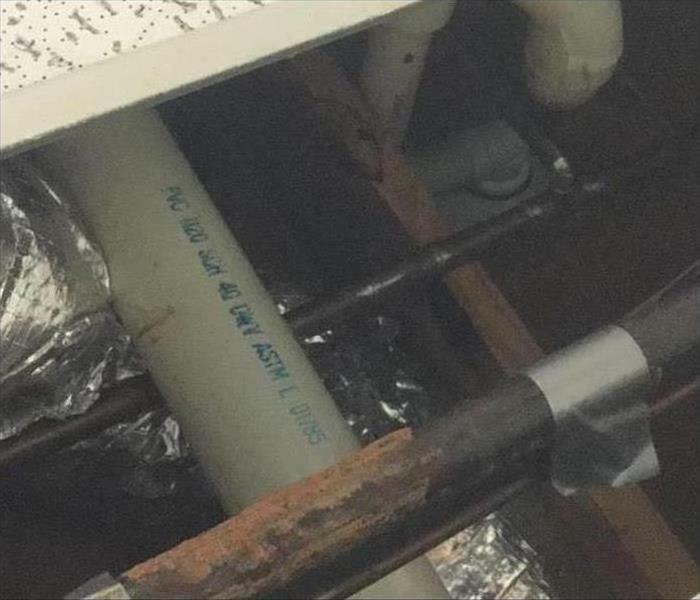 A flex-line leak can cause water damage to a Fairfield Glade ceiling. 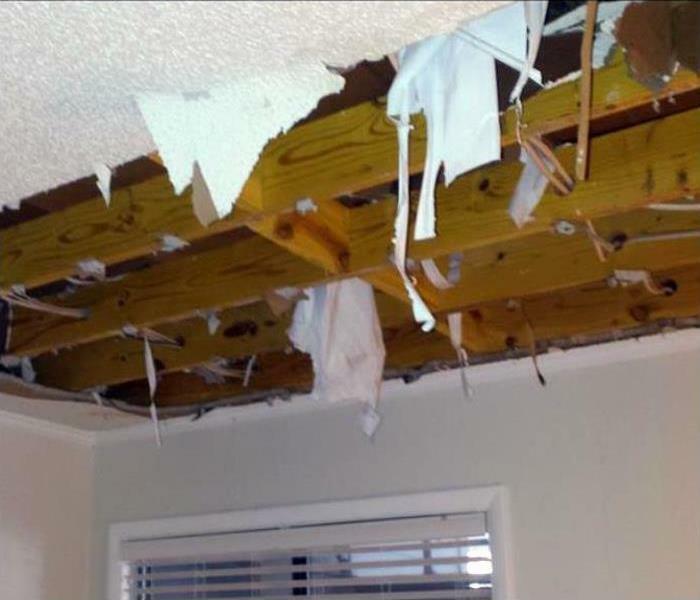 The moisture soaking the insulation and damage to the ceiling material require a neat and controlled tear out by SERVPRO technicians. 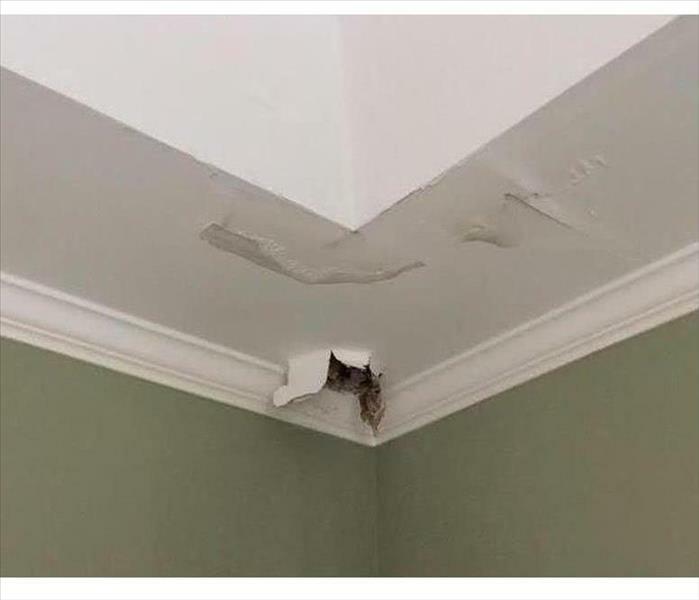 The small drip can be fixed, the batten insulation dried in this case, and the opened cavity dried out in preparation for the reconstruction. 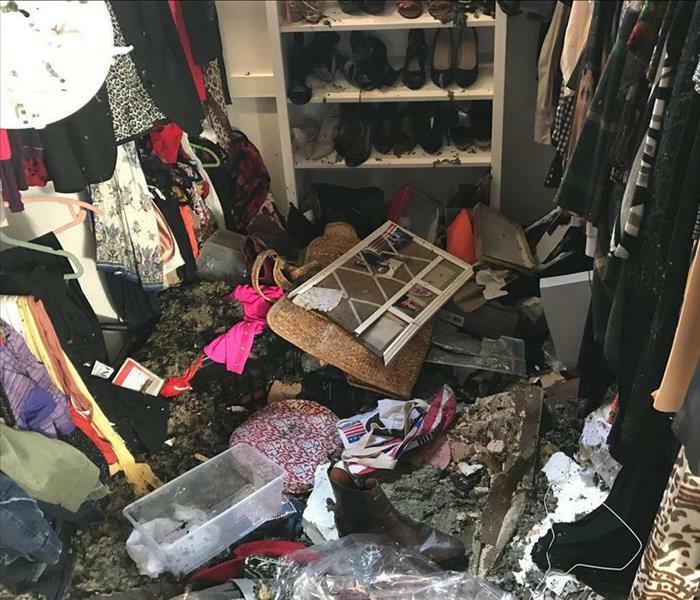 When contaminated stormwater soaks into the walls and carpet of a Crossville home, a tear out and discarding of the hazardous organisms and chemicals are needed. 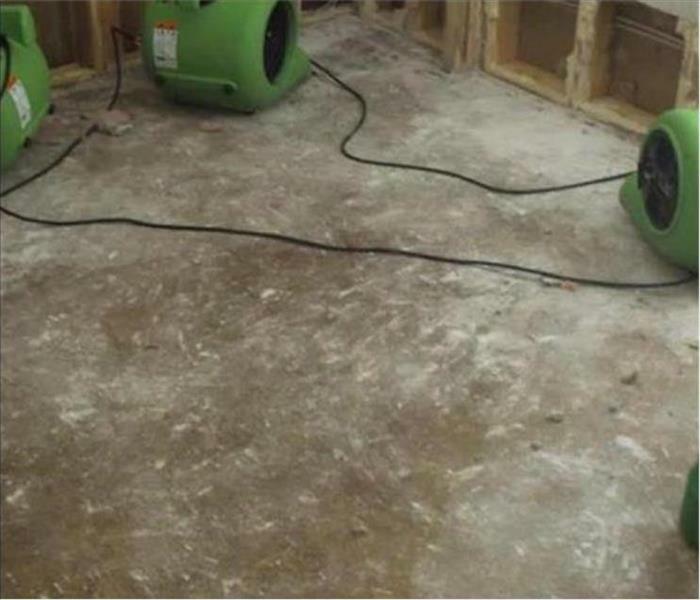 SERVPRO techs, as shown in the Photo can remove the water and then set up drying equipment to restore standard moisture content levels to the affected area. SERVPRO of Cumberland, Morgan & White Counties is your best option when it comes to storm damage restoration. Our experts are highly trained and available 24/7. 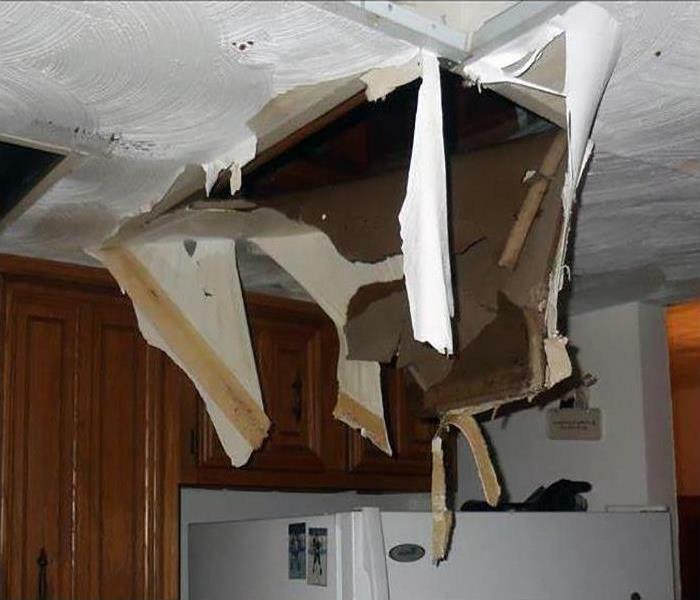 We have the experience and specialized equipment to restore your home to pre-damage condition. We’re Faster to Any Size Disaster! 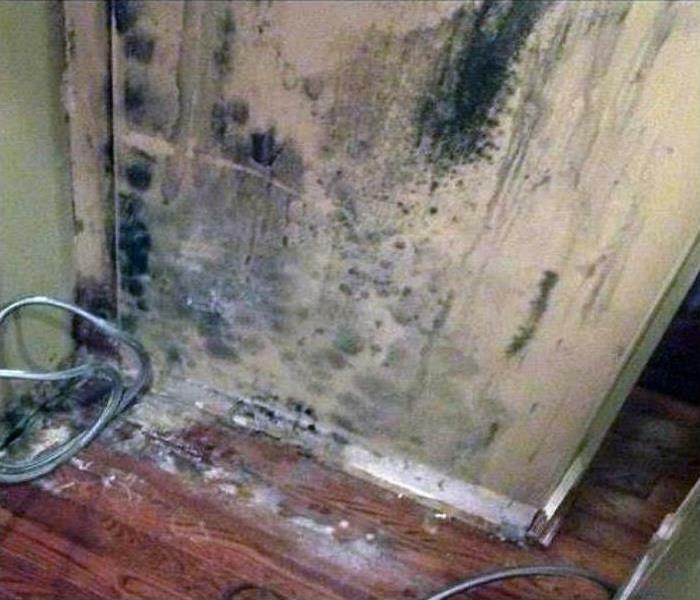 Mold damage at this Sparta home developed when the wall absorbed water from the adjoining bathroom. 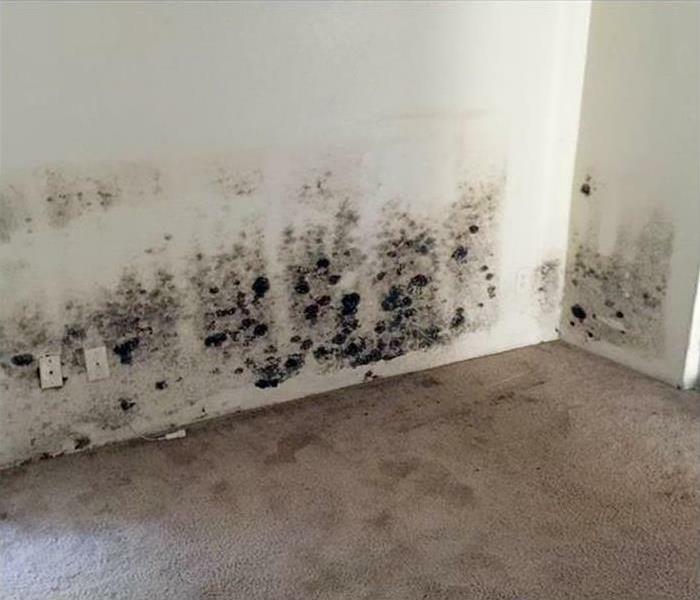 Mold can proliferate very rapidly, so it is essential to call for help when the mold damage is discovered. 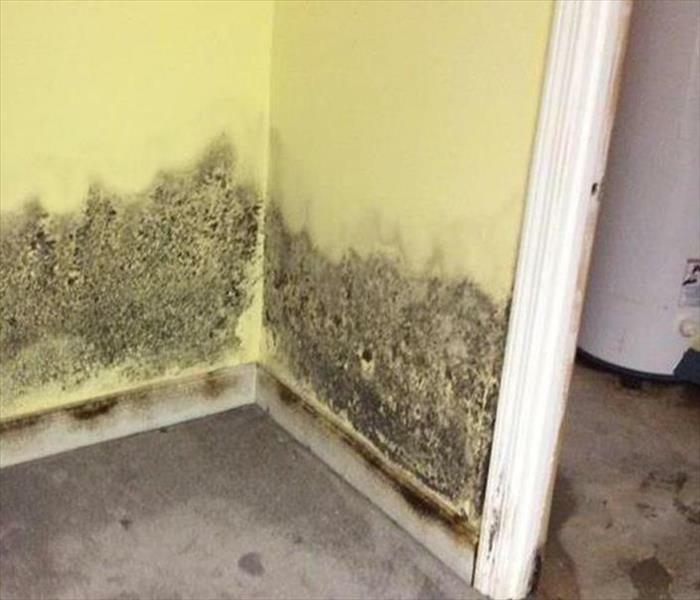 SERVPRO of Cumberland, Morgan & White Counties has an experienced and industry certified team of technicians can come in and clean up your mold problem. 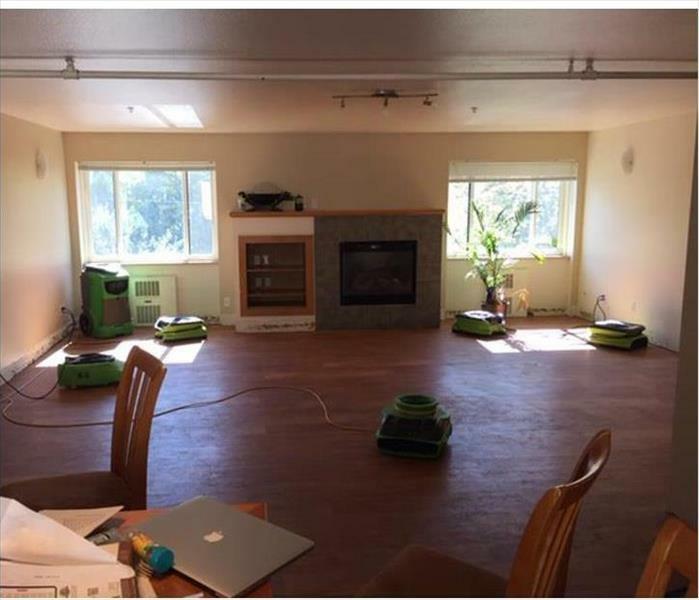 After SERVPRO vacuums the water from the carpet in this Fairfield Glen property, more work is still needed. To prevent secondary damage from moisture leading to mold growth, odors, and deterioration of the carpeting, we can place LGR dehumidifier to restore standard humidity. 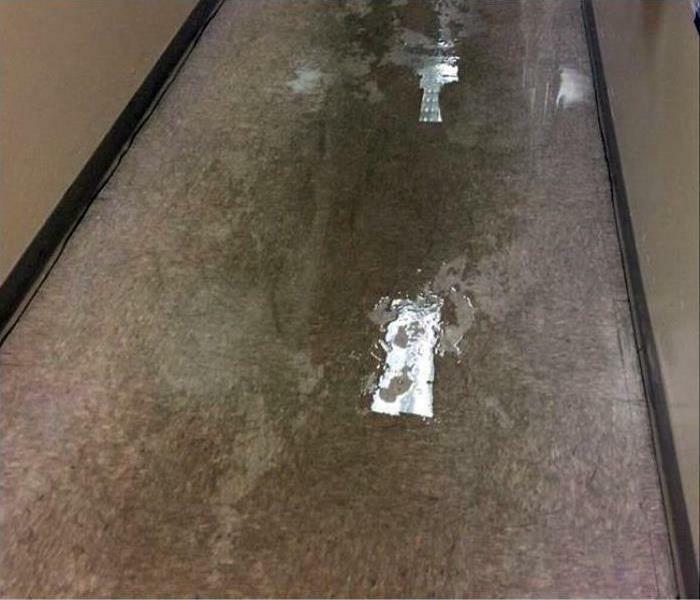 Do not let water damage bring your business to a screeching halt. 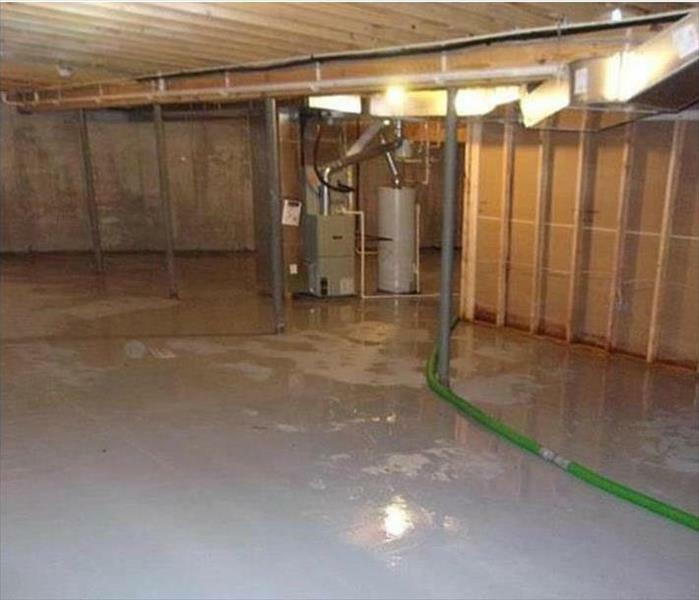 The experts at SERVPRO have the equipment and experience to handle any size water damage disaster. SERVPRO of Cumberland, Morgan & White Counties is available 24/7 and Faster to Any Size Disaster! 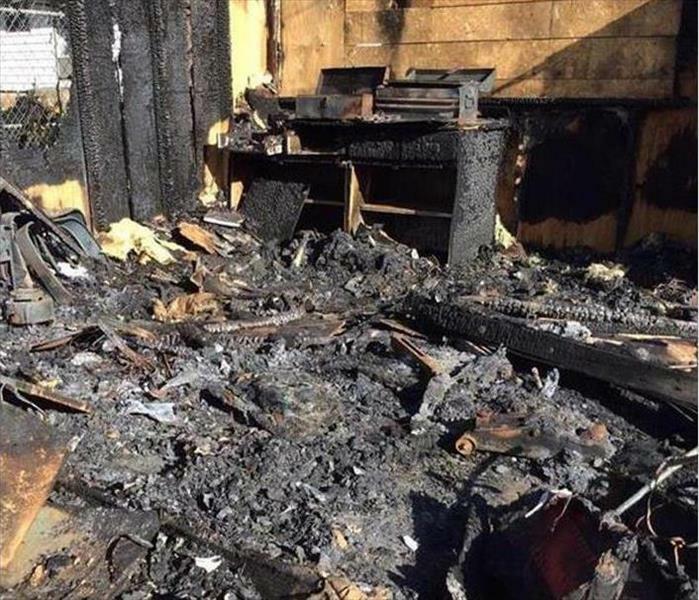 Fire damage at this Crossville home was devastating as the photo shows. The origins of the fire were in the kitchen on the stovetop. There are so many home fires that begin in this fashion. Some are contained in the kitchen while others spread throughout the house. Cleanup would be an essential element of this project. SERVPRO of Cumberland, Morgan & White Counties industry certified technicians would safely demolish the charred elements of the structure and dispose of them properly. After the cleanup phase, the smoke damage and noxious odor would be tended to. When driving rains from a storm penetrate the window seals of a living room, the results can be wet hardwood flooring and soaked furnishings. SERVPRO can vacuum up the water to prevent on-going water damage and also pry off the baseboards and drill weep holes to drain any hidden moisture and increase air circulation. Our green equipment handles the finishing touches to restore a dry environment to this once wet Crossville home living room. Mold damage in Crossville can develop very rapidly when moisture and darkness are present at the same time. The resulting mold can be seen in the photo. 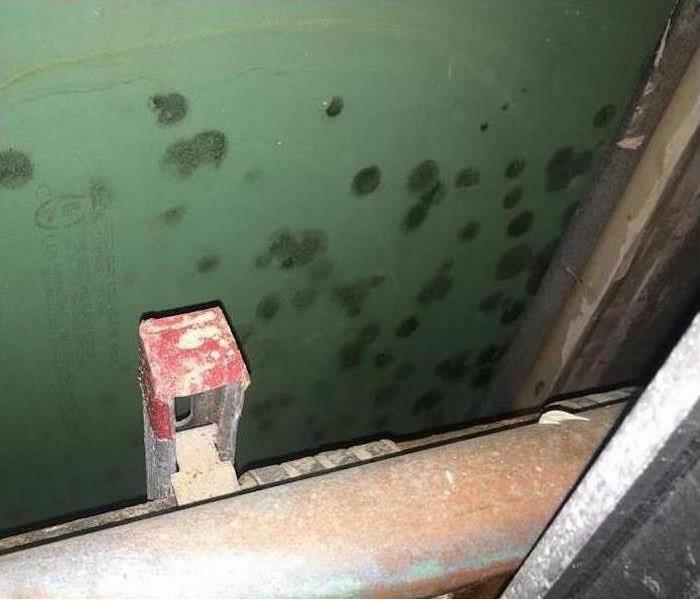 SERVPRO of Cumberland, Morgan & White Counties possesses the products and procedures needed to clean up the mold and return all of the affected surfaces to preloss condition. The last thing a business owner wants to deal with is water damage to their commercial property. The team at SERVPRO is highly trained, IICRC certified, and ready 24/7. 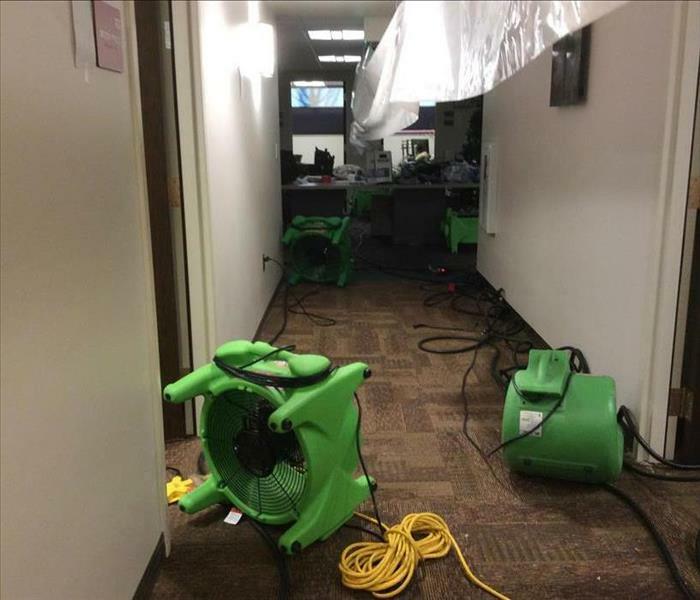 We have the experience and advanced equipment to handle large commercial water damage emergencies. We’re Faster to Any Size Disaster! 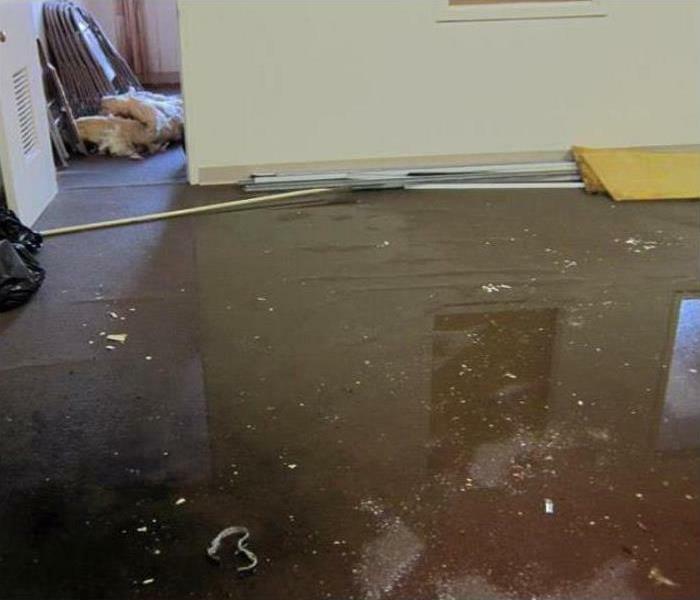 Our team at SERVPRO of Cumberland, Morgan & White Counties can handle any size water damage disaster. We are ready 24/7, locally owned and operated, and Faster to Any Size Disaster! SERVPRO of Cumberland, Morgan & White Counties has the equipment and training needed to restore your home to pre-damage condition. 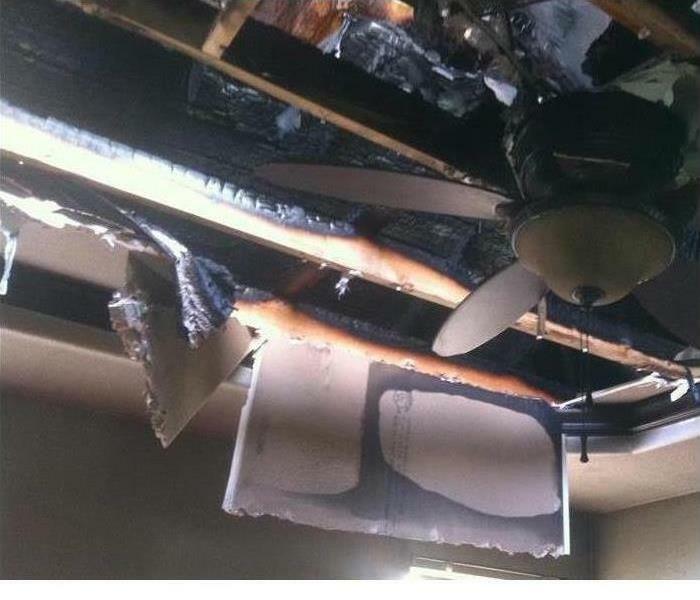 Fire damage in a Crossville home not only ruins the structural properties of the house but also treasured belongings. Like photographs, some pieces of apparel are not replaceable. Ask SERVPRO to use industry-leading techniques and equipment to salvage these precious possessions. Mold damage at this Sparta home developed around the skylight in the kitchen of the home. The seals had become worn out which made it possible for water to leak in and wick into the drywall ceiling. 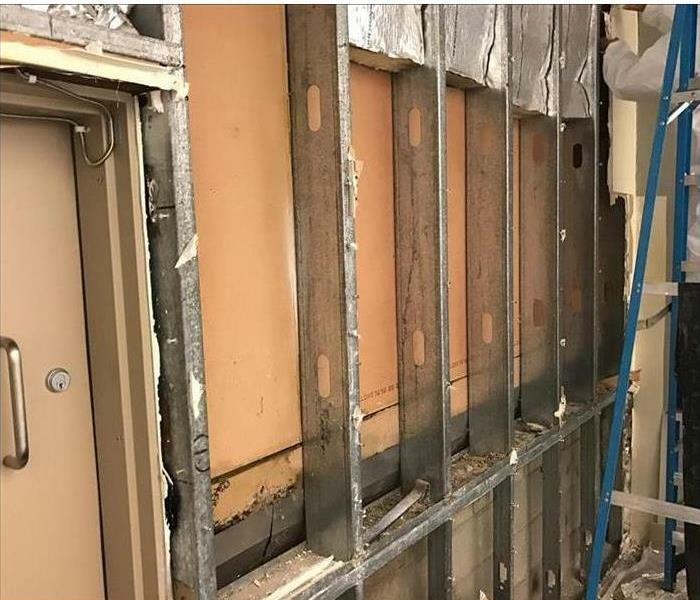 SERVPRO of Cumberland, Morgan & White Counties technicians would be able to remove the damaged drywall and clean and disinfect the entire area. They would then replace the seals for the skylight and install new drywall. 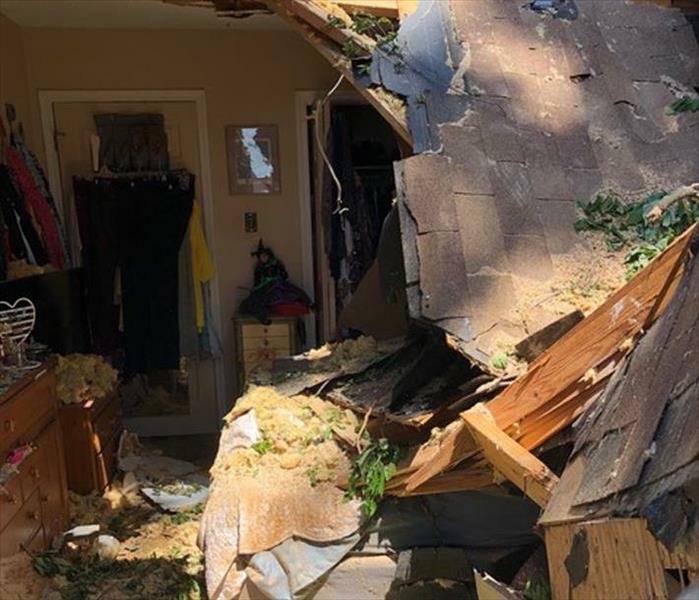 The collapsed roof in this Fairfield Glade area house was the result of strong winds and a tree. Fortunately, this occurred during the day, and no one was asleep in the bedroom. By calling SERVPRO, the debris from the storm can be removed, and the premises cleaned up to prepare for the necessary reconstruction. Water damage to commercial or residential properties in Crossville cannot always be seen with the naked eye. Many times there is hidden water which contributes to the damage. 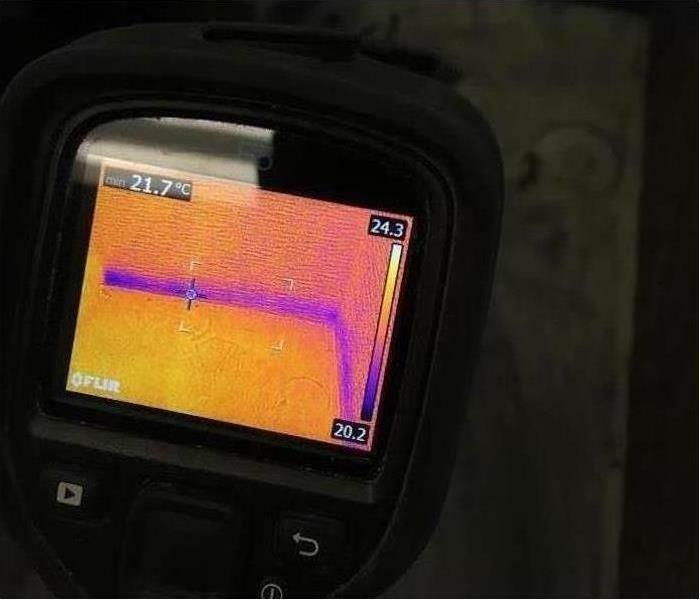 SERVPRO of Cumberland, Morgan & White Counties employs the use of high-tech equipment to help find and plan remediation for hidden moisture. Pictured is an infrared camera which is one of the tools used. The charred debris after cleanup from SERVPRO crews at this Crossville property can be assessed for further work. The smoke that circulated into the house can cause stains and odors, that though removed from the actual blaze, need clean up and restoration. 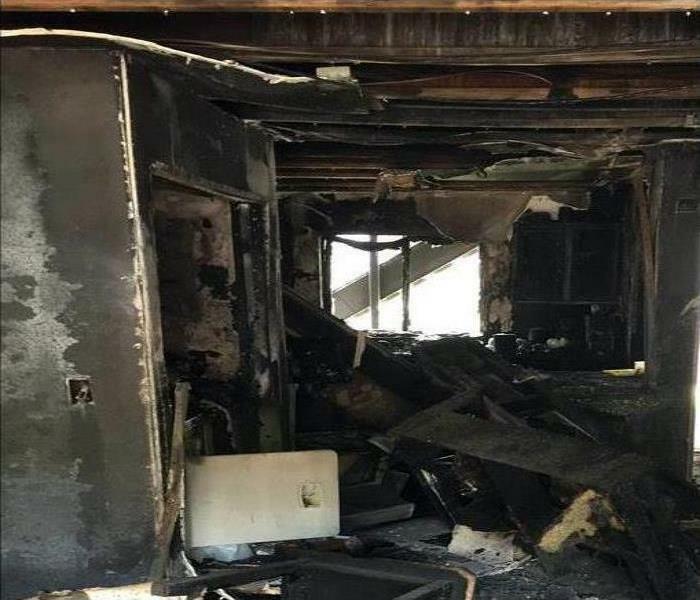 Severe fire damage is a process that involves the property owner, the insurance company, and a great company like SERVPRO. 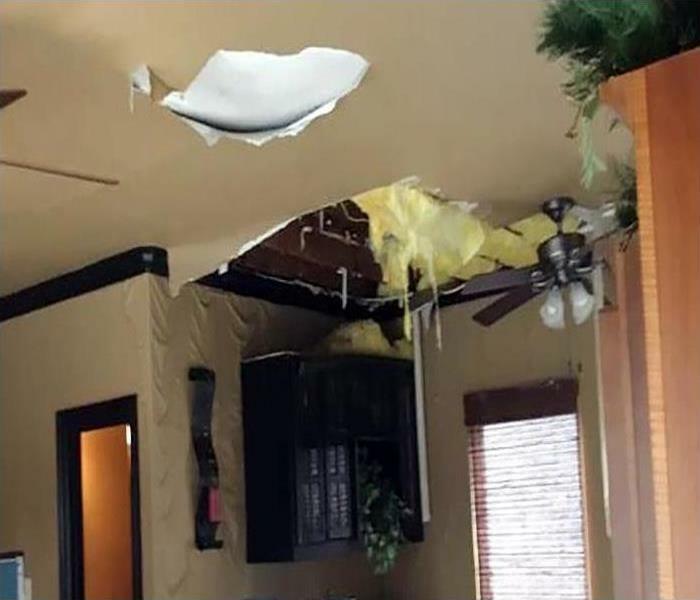 Timing is crucial when it comes to dealing with storm damage restoration. We can arrive quickly to your property quickly thanks to our 24-hour emergency service that we provide our clients. All of our storm damage specialists are certified by the Institute of Inspection Cleaning and Restoration Certification in water restoration, carpet and upholstery cleaning, and other cleaning and restoration courses. SERVPRO of Cumberland, Morgan & White Counties has the advanced equipment, specialized training, and storm damage experience to restore your home to pre-damage condition. 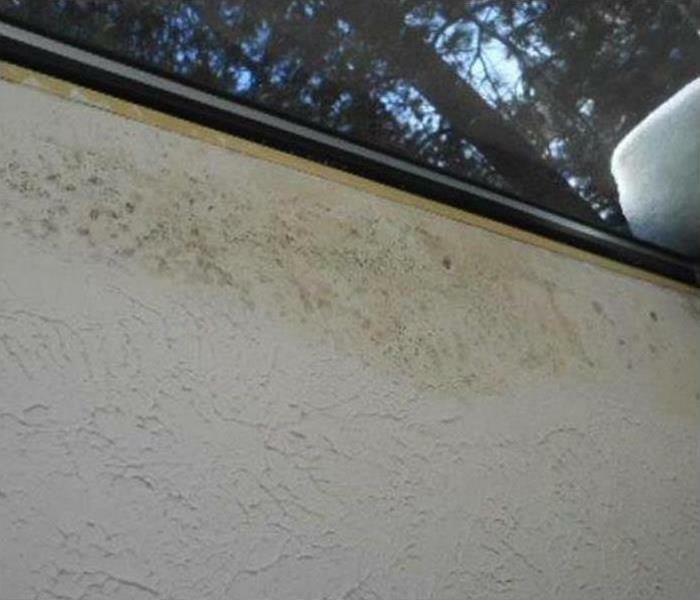 Leakage from poorly sealed windows can allow rainwater to enter the walls and cause the unsightly mold damage in a Crossville house. SERVPRO mold remediation technicians can remove the damaged drywall, and spray an antimicrobial agent to protect against future problems. 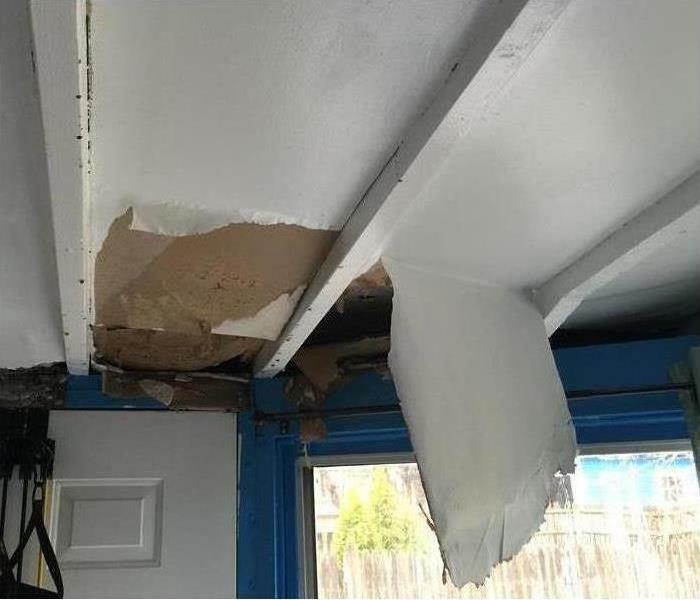 Water damage occurred at this Crossville home's garage because the roof developed a leak which allowed water to enter and collect above the ceiling drywall. The ceiling collapsed once the weight of the water became too great. A ruptured water line in a Crossville storage area of a condominium association led to a call to SERVPRO. Fortunately, the affected area was vacant and the truck-mounted pump made short work of the standing water. The unfinished drywall and studs can be saved dried and saved because of the swift service. The black mold patches on this wall are the result of a vacant house in Sparta being very humid and lacking in proper ventilation. SERVPRO techs know how to deal with this infestation to minimize the circulation of mold spores to unaffected areas of the house. 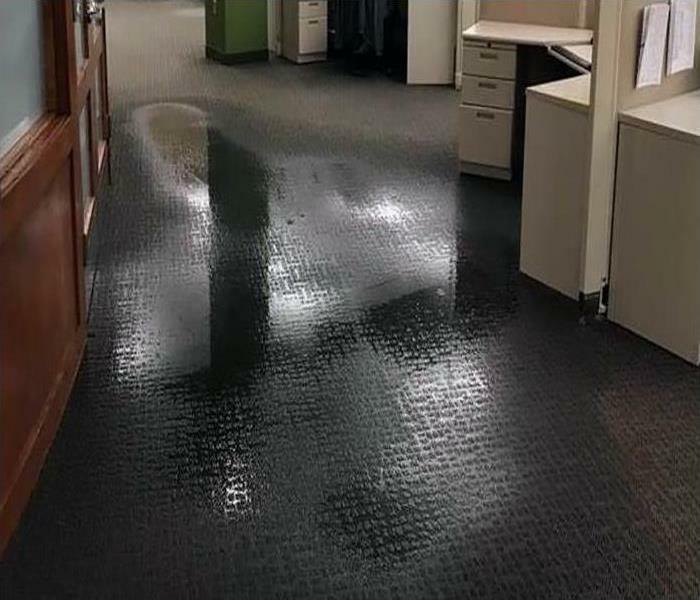 The fire sprinkler system ruptured, and the water cascaded down and doused the commercial grade carpet, walls, and office with water. SERVPRO can set up swiftly dehumidification systems to channel the moisture away from the electronic components within a Fairfield offices. 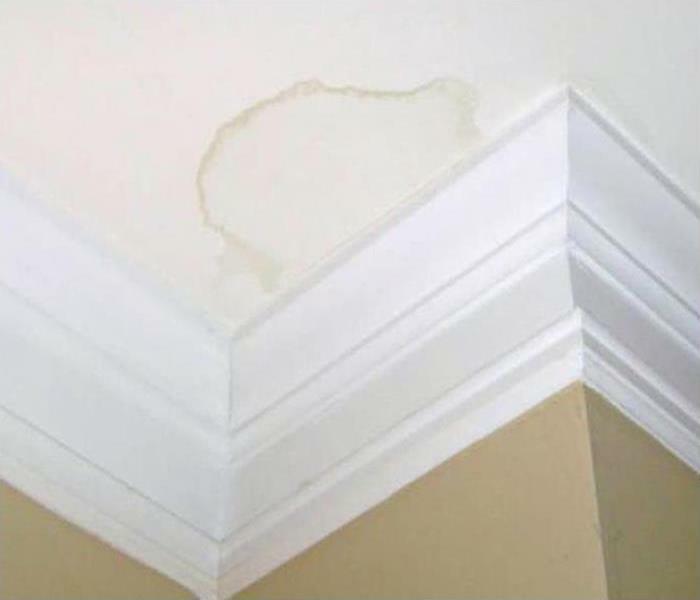 Moisture can be a hidden enemy for secondary water damage. The stormwater deposited a significant amount of mud along with water in this Fairfield Glade property. 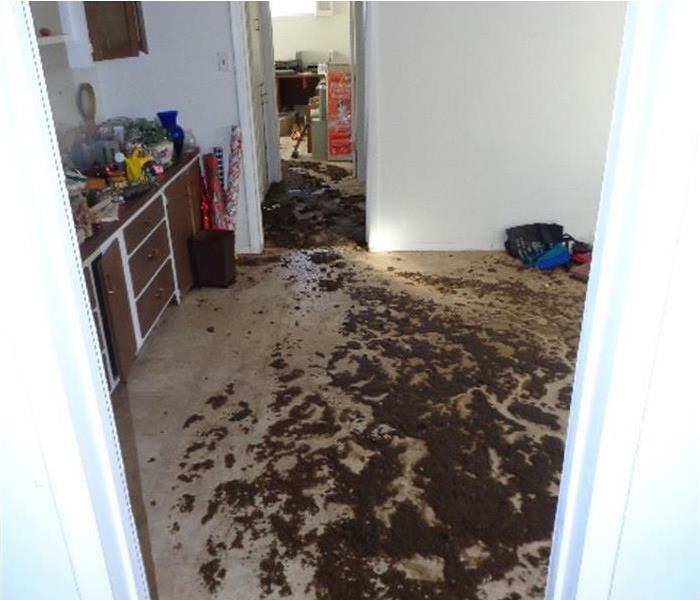 SERVPRO technicians removed the water, and then cleaned up the filthy debris. Disinfecting and sanitizing are key elements for a successful restoration. 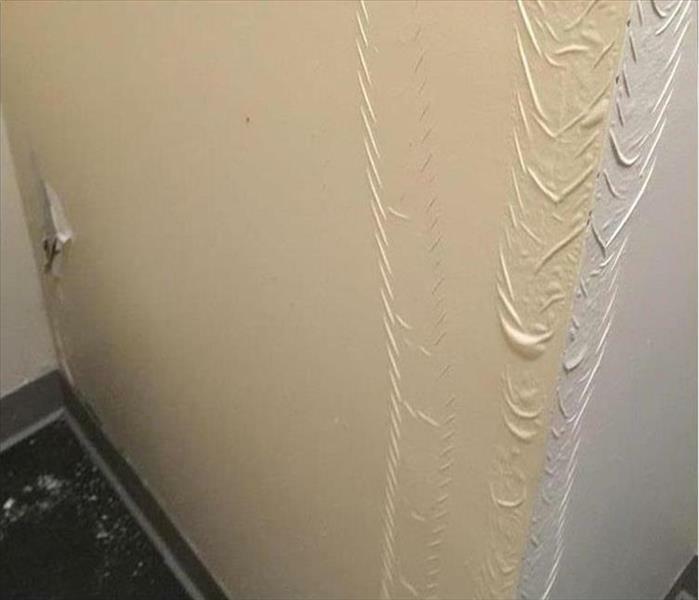 Water dripped for several days in this vacant Fairfield Glade structure, and the ripple effect of the latex paint coating is apparent. After fixing the leak, the peeled off and dried drywall was salvaged. Time is a crucial factor for restoring rather than replacing. Count on our SERVPRO techs to minimize costs and inconveniences for our customers. 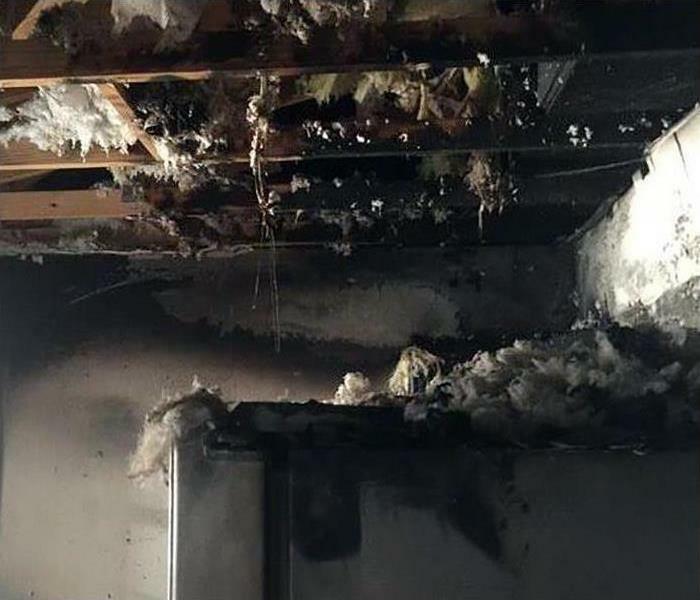 The electrical short in the attic led to a fire damaged ceiling in this Crossville home. SERVPRO technicians initiated the restoration and replacement service with a demolition of the charred, non-salvageable building materials. "Like it never even happened." 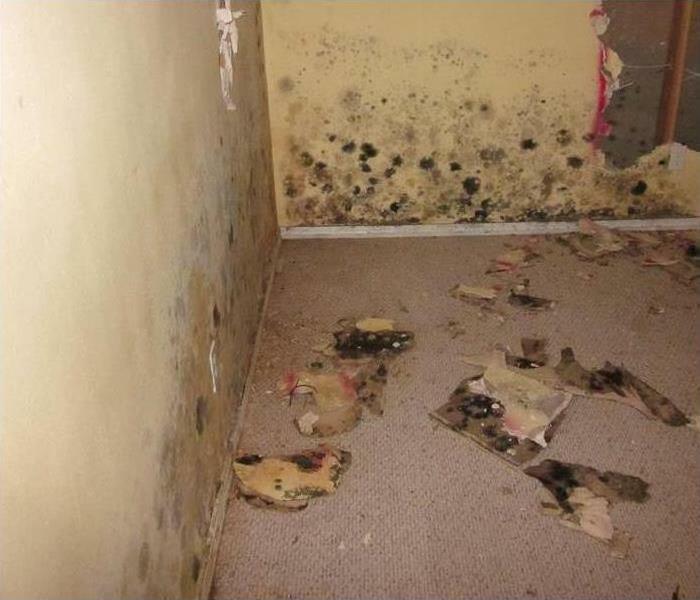 When a unit is vacant, and the interior humidity is not controlled, this photo depicts the possible resulting mold damage. Removing the severely harmed drywall and cleanup and then applying an antifungal agent to the wall cavity are planned. 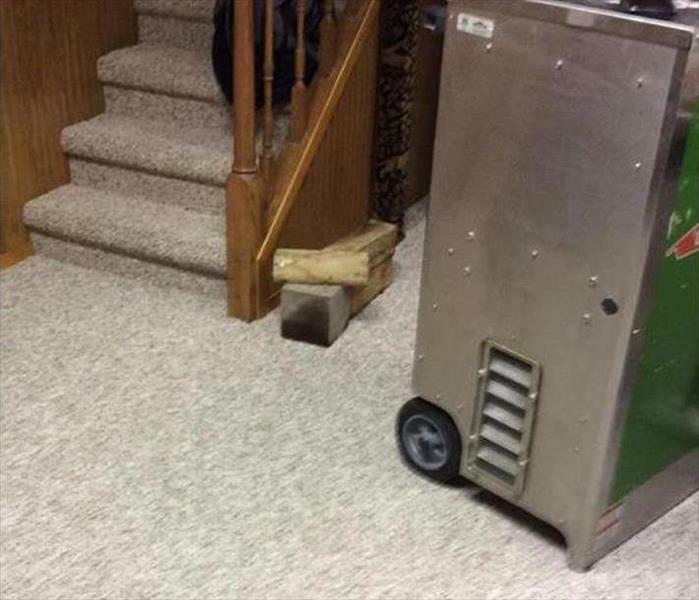 Air scrubbers capture circulating mold spores, particles, and dust in this Sparta property. SERVPRO techs do it right the first time.